Best Value Package – Photos, T-Shirt and Driver’s licence – get great souvenirs in one package and save money instantly. Only with Segway Maui. Get the best value now! 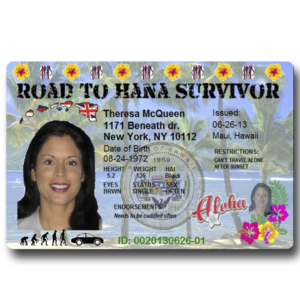 Your tour photos on CD or USB drive with full color T-shirt with your photo and text and Segway Driver’s license – the coolest souvenir from your Hawaii vacation. There is no better way to purchase all three cool and unique souvenirs and save $. Custom full color T-Shirt – Completely customized based on your needs, any photo with any text is applicable, or upload your design in .png format. Unisex, 5.2 oz 100% pre-shrunk cotton. Two needle hemmed sleeve and bottom. With a seamless rib knit collar, taped neck and shoulder seams for durability, and short set-in sleeves that along with the bottom are two-needle hemmed to prevent unraveling, the 5.2 oz Pro Weight t-shirt is Stardust Hawaii’s most popular shirt. We might be out of stock on some colors, let us know your second choice at a NOTE with your order. Mahalo for understanding. Segway Driver’s license: Become a certificated Segway rider! Segway license is a photo Id that shows that you’r cool enough to ride a Segway. 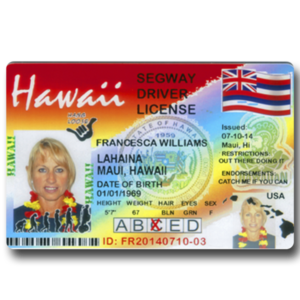 Driver’s licenses made by Segway Maui are the real deal. We made them on same plastic like your real car driver’s license. They are very durable with UV finish for long time usage.